Weiner Tales: The FINAL Breast Cancer Awareness Month GIVEAWAY! Are you all getting tired of me giving stuff away? TOUGH! I love doing it. :-) However, we're coming to a close on Breast Cancer Awareness month. To be serious for a second - please do your monthly check and get mammograms when appropriate. Early detection is key. Mmmmkay?! I care about you all and want you around for a LONG, LONG time. A scarf made by moi (Again, first place winner gets to choose.)! Entries/comments need to be in by midnight EST on Friday, October 3oth and the winner will be announced on Saturday the 31st. This is a great giveaway and wonderful message. Hey girl.. love the blog. I follow you. This is a wonderful giveaway and for a great cause. Early detection is key! Cute stuff! I won't enter this time since I won the previous one! Can't wait for my pink stuff to arrive! Wow! Great Giveaway! 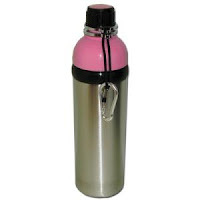 I especially love the pink water bottle! Oh, I just noticed that YOU made the scarves! Sooo pretty! Both are great! what a great giveaway hun!! i love the scarves! wish i had a talent like that!! also follow you on twitter girly! Oh man, do I ever love your giveaways!!!!!!! Love that Greek lotion! I used to have a tube but it's alllllllllll gone now. Okay, 5 entries for me. I did all of the above! This is a great giveaway thanks for doing it for us. COLE! OMG, I am in love - such an awesome giveaway! You are a girl after my own heart! great giveaway and great cause. tmi... I have a hard time with breast self exam. apparently my breasts are just naturally lumpy, according to my doctor. makes me worried about the day that there is something there and I don't recognize it. you are doing some great giveaways!! Goodness! You are the giveaway queen! Please enter me for commenting and following. Now, I have been thinking of doing a giveaway on my blog....any hints or suggestions? great giveaway! I also twittered it @IlanaJacqueline! Wow, what a fabulous giveaway!! 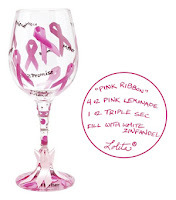 So much awesome stuff - I LOVE the pink wineglass.... I might have to make some of those - they're too adorable! I follow your blog and follow you on Twitter. Also your cake pops from the previous post look amazing! Yum. i follow the blog and follow on twitter @mrssmith909. Just found your blog from Classy Fab Sarah! Yay! Just became a blog follower and I'm now following you on Twitter (I am @jesslaw). Great giveaway! I'm following you on both twitter and on blogger and I posted about the giveaway on both as well! My blog is jhendersonn.blogspot.com and my twitter account is jmhender8. Thanks for the giveaway! What an awesome giveaway! I've seen a ton of giveaways throughout the blog-land but I love the breast cancer awareness. I love your giveaways. I'd love them more if I'd WIN. ;-) Seriously, you do always give away stuff I actually want. Anyhow, I already follow your blog, and follow your tweets. Awesome stuff for an awesome cause :). I am an official follower of your blog and of course have left a comment, so oplease put me in for 2 entries! God Bless and have a great week! Just found your blog! Awesome giveaway and reason for the giveaway. Now I follow you on here! And #3 entry.. I follow you on Twitter ! :) Thanks for the chances to win. Hello, again! I just got finished working on all my entries! Please enter me 5 times! thanks so much for the chance to win great prizes! I am entering for the giveaway, in which if I win I will be giving to my partner at work.She was diagnosed with Breast Cancer in April of this year and just last week finished her last Chemo treatment. =) Thank you for blogging about it! Yeah! I just heard about you from my friend, so #1, I FOLLOW YOU, #2, I AM COMMENTING WITH THIS POST, #3, I WILL POST ABOUT YOU ON MY BLOG! That's 3 entries for me!!!! I want to thank you for doing this Breast Cancer awareness. I keep their click each day on my blogs. I signed up to get your blog on Google.